The world’s largest breast cancer organization, Susan G. Komen for the Cure, is partnering with Jerusalem, Hadassah: The Women’s Zionist Organization of America, health advocates, and scientists for a week of breast cancer-related events. The Komen organization is launching the Israel Breast Cancer Collaborative, a partnership with nongovernmental organizations in Israel, to enhance advocacy, awareness, screening, and treatment of breast cancer in Israel during the week of Oct. 25 to 29. A series of events will include a think tank on breast cancer, a mission to Israel, and Komen’s famed Race for the Cure, which will be held just outside Jerusalem’s Old City. While not an overtly Jewish charity, Komen has deep Jewish roots. 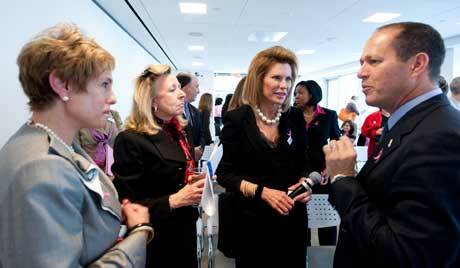 Nancy Brinker started the organization in 1982 after her sister, Susan Komen, died of breast cancer. Brinker is Jewish, as was Komen. Susan G. Komen for the Cure has invested more than $27 million in funding for international breast cancer research and more than $17 million in international community education and outreach programs. Komen has partnered or funded programs in more than 50 countries. While most of the money raised by Komen goes to general breast cancer causes, the organization has given $2 million for research in Israel through the Weizmann Institute of Science, Hebrew University-Hadassah Hospital in Jerusalem, Beit Natan, and Life’s Door. In the United States it has ties to Hadassah, Sharsheret, and the American Jewish Joint Distribution Committee. This will be the first time, however, that Komen has held the 5K Race for the Cure in Israel. “This is exciting. For me it is very exciting,” said Hadassah Lieberman, who joined Komen as its global ambassador several years ago when the organization ran its first international race in Sao Paolo, Brazil. The race has since been held in countries such as Germany, Italy, and Egypt. According to Komen officials, breast cancer is the most common form of women’s cancer in Israel, accounting for nearly 30 percent of new cancer cases in the country. About 4,000 people are diagnosed with breast cancer in Israel each year. In bringing the race to Israel, Susan G. Komen for the Cure hopes to spark new collaborations with organizations such as the Israel Cancer Association and to raise awareness of breast cancer in Israel. This might seem a precarious time for an international fund-raising organization to broaden its ties with Israel, with the country feeling the fallout of the flotilla incident in terms of public opinion, but Lieberman says she does not believe it will be an issue for Komen’s fund-raising.